We wanted to take a moment to thank YOU. 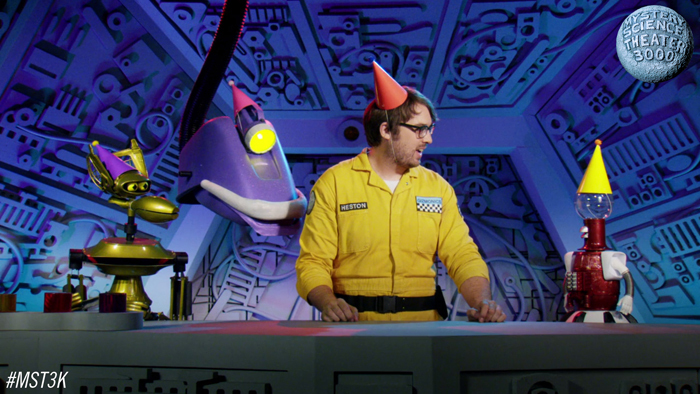 We owe sincere gratitude to the MSTies who made 2017 an incredible year for Mystery Science Theater 3000. We got to see you in person during the summer live tour and meet you at San Diego Comic-Con. We had another great Turkey Day Marathon and a summer Twitch marathon. We launched a new site and some cool new merchandise. We got renewed for Season 12! And of course, the biggest moment of all was when we made our triumphant return to your living rooms in April after an all-too-long hiatus. It's been one heck of a year, and we have you to thank for it. You have proven time and again that you're the best fans in the world. We'll see you in 2018 where more great things will happen. Until then, repeat to yourself: it's just a holiday season, I should really just relax. Happy new year! When will Season 12 come out? I can’t stand waiting! Yay, can’t wait to see the new ones. That goes both ways – MST3K has always treated its fans extremely well. On to Season 12! Might I recommend the Mark Hamill vehicle ‘Slipstream’ for an upcoming episode?